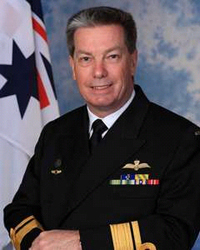 The Diplomat speaks with Rear Admiral Tim Barrett about The Royal Australian Navy’s strategic posture in the region, concerns about regional flashpoints, relations with China’s navy, and numerous other issues. The Royal Australian Navy, or RAN, is a force that has a significant profile in the Pacific. In an exclusive interview, Rear Admiral Tim Barrett, the RAN’s Fleet Commander, spoke to The Diplomat’s Serge DeSilva-Ranasinghe about the Navy’s strategic posture in the region, concerns about regional flashpoints, relations with China’s navy, and numerous other issues. What is the scale and scope of the RAN’s presence in both the Asia Pacific and the South Pacific regions and what are its strategic and operational priorities? My role as the Fleet Commander is to implement broader defense and Navy strategic aims. I raise the ships and prepare them – to either conduct operations as part of Navy’s international engagement program, or indeed to conduct operations as part of the joint operations command. So I implement rather than define the policy or direct it. The Navy has had a long-held presence in both Asia and in the South Pacific. We continue to engage through the usual mechanisms. This includes Navy-to-Navy talks and we do this with a significant number of nations within the region – Indonesia, Singapore, Malaysia, Thailand and Papua New Guinea, to name a few. These talks are important. They establish links and networks. It allows senior leaders to talk freely and quickly to each other, based upon mutual understanding. This allows issues to be settled. We do have a regular engagement with all those partners. But equally, and particularly in Asia, we conduct a number of exercises on an annual or biannual basis with all of those countries. There are various defense agreements which have been in place for quite some time that tie us to exercise commitments with Singapore, Malaysia, New Zealand and the U.K., for instance. But we also have a number of bilateral exercises we conduct with Indonesia, Singapore or Malaysia. And each of those might involve sending ships, submarines or patrol boats into areas – to collaborate and cooperate. It might be around a staged event or a scenario looking at a certain maritime security aspect. We need to understand each other’s strengths so that we can collaborate should we have to go into something collectively. Our strongest relationship is probably with Indonesia because it is our closest neighbor of significance. We regularly conduct cooperative patrols, usually with our patrol boats, to the waters between Indonesia and Australia, particularly areas north of Darwin. Your question was also about the South Pacific. We conduct a similar range of activities, although probably not quite as significant as we do to the North. You’d be well aware that we’ve had a long standing arrangement with the Pacific Patrol Boat Program, which allowed us to assist those areas with the basics of maintaining and operating patrol-boat sized vessels so they can conduct activities such as illegal fishing surveillance. We continue to maintain engagement and we still have a network of maritime surveillance advisers in the area. There are fewer Navy-to-Navy talks with each of those individual nations in the South Pacific, with the exception of New Zealand. But there’s still a fair amount of engagement. The International Fleet Review was probably the best indicator with quite a few of those nations sending ships. If you were to compare the RAN to other navies in North East Asia and South East Asia, how does it rank in terms of size and capabilities? We are a medium-size navy. Let’s accept that. There are navies in our region that are larger. That said, my remarks need to be qualified by how others see us rather than what we think of ourselves. As I have just said, for the RAN to recently embed into the U.S. 7th Fleet, or to run a significant part of the RIMPAC exercise, it does prove a level of competency in key skills. We operate eight ANZAC class frigates and they’re being upgraded at the moment. We still operate four Oliver Hazard Perry-class FFG frigates. We also have support ships, tankers and replenishment ships. We have amphibious capable ships in Tobruk and Choules, and a number of smaller vessels that still conduct a significant role – be they Armidale Class Patrol Boats, Minehunters, and we operate a submarine force of six Collins class submarines. Importantly, over the next five years the Navy will be reinvigorating the fleet. The introduction of two new LHDs has commenced, each of them being 27,500 tons and larger than any ship that we’ve operated before in the navy. Then the reinvigoration of the air warfare capability in the Air Warfare Destroyer. Three of these will be delivered over the next few years. The new Seahawk Romeo combat helicopter will replace our older versions of Seahawk. Recently we bought and will now retain HMAS Choules to support the amphibious role. We are moving to a good level of sophistication and a very good level of operating capability. So the Navy will change shape in a little over the next five years. Have there been any concerns raised by neighboring states about the development of the RAN’s amphibious capabilities and its purpose? No. I think because the development of our amphibious capability, and in particular acquisition of the Landing Helicopter Docks have been included in Australian Defence White Papers over a period of time there was a great deal of transparency. So the reasons why Australia would choose to develop this capability and buy such large ships to promote that capability has been accepted in the region. It is also assisted by our engagement in a large number of maritime security forums in the region that look at similar issues to us, for example humanitarian assistance and disaster relief. This capability fits quite neatly into the activities of a number of Navies in the region at the moment. Tell us about the regional flashpoints in the Asia Pacific that concern the RAN? Clearly at a strategic level an area of heightened concern at the moment is around the South China Sea and some of the issues of territorial dispute. Australia has a very firm view there and that is for those nations involved to find a diplomatic solution to resolve the issues. But clearly we are interested in that resolution because of the trade that comes to Australia through those waters. But there are a number of other common issues. Some of them are non-traditional, for example the rise in transnational crime, piracy, and a range of other activities. Australia is seeking membership of RECAAP, the regional authority that looks at piracy. They report on a regular basis where specific acts of piracy do occur, particularly in the South China Sea and the areas towards the Philippines and in parts of the Malacca Straits. Our contribution will not necessarily be the provision of ships, but through engagement in some of those international forums where we can offer advice, particularly from our experience in anti-piracy patrols off the Horn of Africa. Clearly in the Pacific illegal foreign fishing is a very significant issue for the smaller countries of Micronesia where fishing is both a staple product for the survival of their own population, but is also an element of how they earn export dollars. So any large-scale disruption of how they conduct their fishing in that area, by other nations, is a real concern. Again we participate in regional forums in which we assist in managing those issues, particularly when they become issues of transnational crime. What about the situation in the East China Sea? It’s also an area we observe, but we don’t necessarily spend a lot of time in it. We are more concerned about boundary disputes, but more importantly we are concerned about how they’re going to be resolved by nations directly involved on those borders. When we send ships to the area, it is normally to pursue other activities, not to be involved in the resolution of those activities. How does the RAN view the proliferation of submarines among Asia Pacific navies? It is right to say that we are watching what other navies are doing in the region with respect to submarines. The submarine is a strategic asset and we do need to see what those submarines might be used for to consider our own capabilities to counter or to match their operations. I think that is quite openly reflected in the Defence White Paper. With China I know that the Chief of Defence Force has a forum where they meet with their Chinese counterpart. Tell us about this? We have involvement. The Chief of Navy recently spent time in China and spoke to his counterpart. Our interest is in acknowledging each navy’s contribution to maritime security in the area. We conduct exercises to demonstrate our ability to work together. That will ultimately be part of a broader engagement that Defence has with China. Given that China is expanding its navy, what are the RAN’s objectives in relation to engaging with China’s navy? I would characterize it as seeking to do what we do with other regional navies. We need to understand their concerns in terms of regional maritime security. I’ve been to numerous forums where we have sat down with several navies at a time to discuss very common issues around maritime security. The aim is to confirm that we have an understanding of how you might approach a solution and it’s important to know how different countries might approach those specific solutions. Could you also walk me through the RAN’s relationship with Northeast Asia too? I’d characterize our relationship with Japan as strong. We have regular talks and, in the last 12 months, we’ve had a ship attend their International Fleet Review, and have conducted submarine exercises as well. In South Korea we’ve had exercises based on contemporary maritime security type issues. I would characterize us as reinvigorating our relationship with China. We’ve had a number of ship visits in the past and we’ll continue those as we build our relationship with China. I’d also like to explore the relationships with other Southeast Asian countries. For instance, how is the RAN looking to liaise with Myanmar? We don’t have a formal relationship at this stage, and I don’t have an exercise program that involves us directly in those areas. We engage in regional forums such as the Indian Ocean Naval Symposium where issues of maritime security significant to Myanmar are discussed but we don’t have a direct relationship at this stage. What’s about navy-to-navy relations with other countries such as Thailand, Cambodia, Vietnam and Brunei? Again, we don’t have a formal direct relationship, but we engage in regional forums that allow us to meet. For example, the ADMM Plus forums. Indeed prior to the International Fleet Review we conducted exercises with a number of ships from those nations – Brunei, Malaysia, etc., as part of an ADMM Plus program. During the ADMM forum working group on Maritime Security we discussed the conduct and coordination of surveillance patrols against illegal foreign fishing or the importing of illicit drugs. As such we concentrate on regional forums rather than individual Navy-to-Navy relationships. In terms of the U.S. rebalance to Asia, what sort of impact has it had on the RAN’s operational deployment and/or strategic objectives? The rebalance, of itself, has not dramatically changed our existing engagement with the U.S. Navy in this area. We continue to have a strong engagement with the 5th Fleet in the Middle East as we have had for many years. We’re just about to send another ship away on rotation to the Middle East, and that will be the 57th rotation of ships since the early 90s. Likewise with the U.S. 7th Fleet, we have a strong relationship in the Pacific and in Asia. We exercise regularly. We have, over a period of time, embedded some of our ships into the 7th Fleet. We participate in exercises with the U.S. in the Pacific, predominantly in RIMPAC. Our relationship is that close that last year we were able to furnish a large headquarters staff who ran a significant part of the maritime component of that exercise. You don’t get the right to do that, or the opportunity to do that, unless you are well accepted within the U.S. naval community. What sort of future do you see with the RAN in the region generally? In terms of the changing strategic dynamics, how do you see the RAN fitting into the region in the coming years? With the LHDs, the opportunities for us to cooperate among some of our regional partners in a broader range of activities, including amphibious or humanitarian assistance will be increased. Equally, we are likely to continue with the alliances we currently have – particularly with the U.S. We share a common view of maritime security issues. I just think we’ll be able to do it a little better with the likes of LHD than we probably have been able to do in the past. Serge DeSilva-Ranasinghe is a consultant and non-resident fellow at the National Security Institute, University of Canberra.